Two healers, two hearts, one final battle. Will they survive? A MUST READ for fans of Cheri Champagne's best selling Regency Romance Mason Siblings Series. 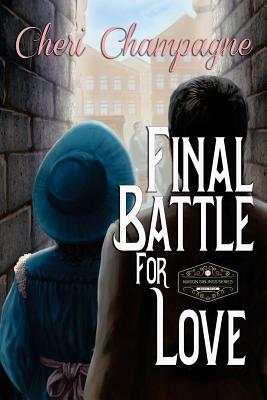 The Final Battle for Love is the final battle in the series. Dr. Lord Simon Claridge, heir to the Earldom of Merrington, has known about the Mason family's involvement in spy activity for some time and has gradually become their personal physician. After an incident with one of the Mason sisters, things changed. His rapport with Lady Emaline became strained, and as much as he tried to stop it, the woman was suddenly everywhere in his thoughts. Cheri started writing as a child, and began reading historical romance novels at the age of fifteen. She took several creative writing and English courses in college and university, but graduated with an Applied Business Technology certificate. She worked for several years before her first son was born, and decided thereafter to stay home. Passionate about her sizzling historical romances, Cheri combines her loves and writes as often as she can manage, coming up with a seemingly endless supply of plots. Not long after being picked up by Pandamoon Publishing, Cheri became a part of the Acquisitions Team, then was soon promoted to Acquisitions Manager. She is overjoyed and honoured to be a part of such an amazing and wonderfully talented Panda family. She married her high school sweetheart and they live in BC, Canada with their four young children and their dog.